The writer of the book of Wisdom is sharing the special insights of Jewish thinking to a society heavily influenced by Greek thinking. Greek thought promoted dualism. The human body was evil and continually dragged the mind and spirit down to earth. The result was a thinking and feeling that there was a large gap between humanity and God. Too large to be bridged! What do you think? Have you ever pondered how magnificent God is in creating and sustaining all of ʻcreationʼ? Have you ever created something and felt a deep connection to it because it is ʻyour creationʼ? If the same is true for God, what does this mean for Godʼs relationship to you personally? 1 and 2 Thessalonians are the earliest letters we have in the New Testament. A fear had taken over the community that the final ʻday of the lordʼ was here. Some had left their jobs. Have you had an unsettling faith experience which shook your mind and caused you ʻalarmʼ? How did you cope? Did you choose to walk through it or around it? The Gospel of Luke continues to share with us the relationship that Jesus and God has with ʻtax collectorsʼ (who were considered the greatest sinners and outcasts because they taxed Jewish people and gave this money to the occupying Roman soldiers and government). Zacchaeus was the Chief Tax Collector of the large city of Jericho. He would have been extremely wealthy. And yet he does something extremely humbling – he climbs a tree. He publicly admits he is short in front of the large crowd. He exposes himself to ridicule in his effort of seeking Jesus. Life changing meetings with Jesus are often the result of extraordinary actions by gospel characters. What made Zaccheaus climb the tree? 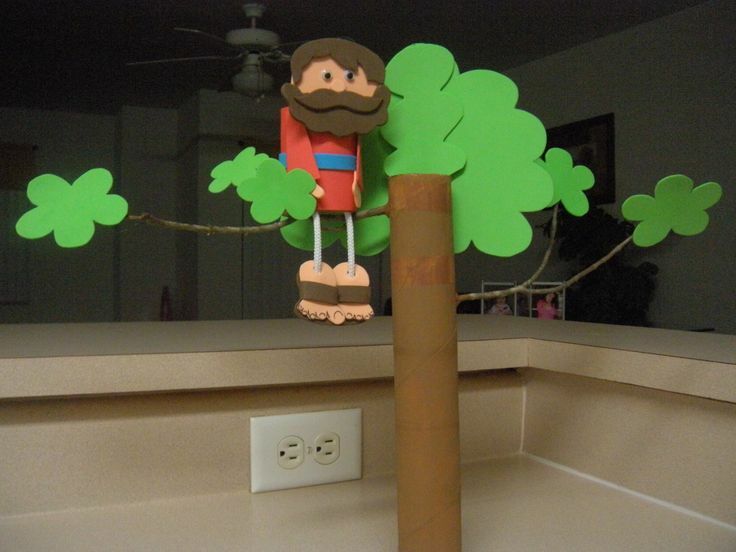 Instead of climbing the tree, what action could you take to get closer to Jesus? What is the risk or fear that could stop you? Who could give you support or advice? For Jesus, seeking out and saving the lost was not an ʻideaʼ but a lived reality. To the greatest ʻsinnerʼ in Jericho, he says: Zacchaeus…. today I must stay at your house. What does this teach us about Jesusʼ understanding of his mission? What does this teach us about the mission of the Church today? What conversion needs to go on within you to live out this mission of the Church? Salvation is not something that happens in the far distant future. Jesus says it happens ʻtodayʼ for Zacchaeus with his actions in response to Jesus. He gives half his property to the poor and promises to pay the full price of compensation that Roman law states (four times the original amount). Living salvation ʻtodayʼ is radical. A daily response to the love of God revealed in Jesus and his life-style challenging gospel message. The one who was outside is ʻinsideʼ. Can you be at home in this inclusive community of the Church? What will you do if a modern ʻtax collectorʼ does not ʻrepentʼ? 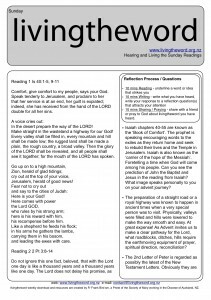 18th Sunday – What is enough? Paul continues to teach the Colossians about Baptism. The baptism ceremony involved taking off their old clothes, being plunged into water as if being plunged into the earth like Christ to ʻdieʼ. They would rise and be annointed with oil, and be clothed with the white garment of the ʻnew selfʼ. These external signs were symbolising a change within the person. A baptised christian is now dead to the world and alive with Christ. Consider a phrase such as ʻSport is his lifeʼ, or ʻMusic is her lifeʼ. What does it involve do have an all encompassing pursuit or hobby? What is Paul suggesting by a favourite phrase he develops in this letter ʻChrist your lifeʼ? 28th Sunday – let go….. The Book of Wisdom is thought to have been written by King Solomon. Today’s text links to the story of young King Solomon, newly married to a princess of Egypt, heavily aware of leadership responsibilities and following the example of his Father, King David. In 1 Kings 3:6-9 Solomon prays for wisdom – a heart to understand what is good and what is evil. Today is Solomon’s reflection on just what a precious gift wisdom is. Have you ever needed to search for and find a wise person to offer direction and guidance? How would you describe your need? What happened? ‘I chose to have her rather than the light’. Wisdom is not a ‘possession’ or equal to worldly wealth of Gold of Silver. It is the spiritual gift of knowing the truth and the very will of God. 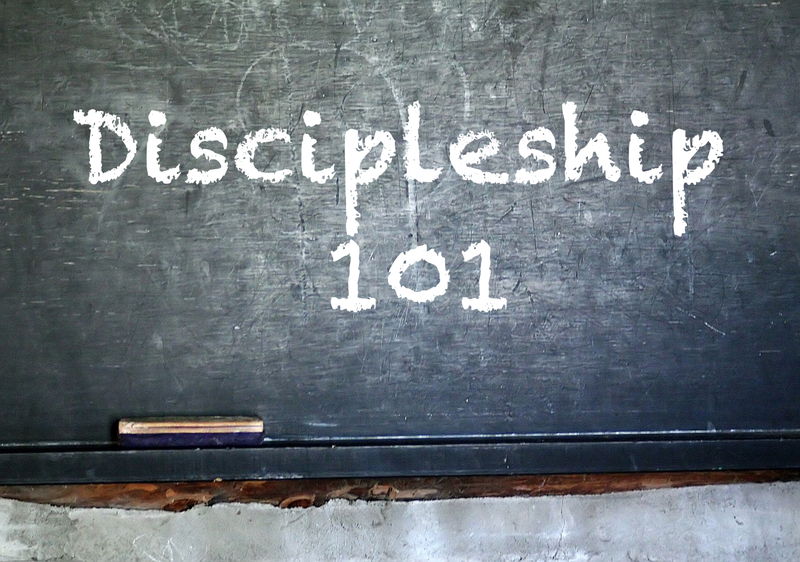 ‘Discernment’ of God’s will is a discipleship skill. It literally means ‘to cut away’. Consider a choice that you need to make. List the choices. Pray for wisdom. ‘Cut away’ options that are shallow, unspiritually motivated. Pay attention to the desire beneath the choice. Ask a wise person for advice. Hebrews is written for Jewish Christians struggling with persecution and the difficulties and fragility of the early christian church.They remembered with joy the clear Jewish laws and customs and the sacrificial practices of the Temple. The author of Hebrews points them to the penetrating power of the Word. Have you every experienced the powerful and personal way the scriptures can reach deeply inside you and speak to you deepest pain and questions? Reveal you to yourself? Challenge you? Inspire you? What scripture passage has done this for you? What happened? The theme of wisdom is contrasted with wealth in the Gospel. A rich young man faithful to the ʻlawsʼ still finds himself unsatisfied in life. His question: ʻWhat must I do?ʼ is still focussed on external actions of obedience. Jesus wishes to lead him from ʻobservance of lawsʼ to ʻliving in loveʼ. The invitation to change the base of his security from possessions to ʻtreasure in heavenʼ causes his face to fall. What possessions would you be terrified of letting go? Why? Do you trust that God will supply everything you need? The invitation to a deeper discipleship does not necessarily require letting go of ʻwealthʼ but letting go of its ʻattachmentʼ. Jesus uses an image. To get a camel loaded with items for trade through a ʻnarrow gateʼ in Jerusalem required unloading items, the camel sometimes having to kneel down and crawl through a small space (eye of a needle). Some scholars also suggest a misspelling of a word means it is a ʻcableʼ that is trying to be threaded through the eye of a needle. How would you describe your ʻuse of wealthʼ. Is it available for building the Kingdom of God? The needs of the poor? How much ʻsecurityʼ and ʻlifeʼ does your bank balance or possessions bring you? What does this story reveal to you personally? Peter implies a disciples question about reward and security. 100% is an incredibly fruitful return. Normally a return would be 10%. It will be mixed up ʻwith persecutionsʼ however. Consider asking a Priest, Brother, Sister, Christian friend how they have experienced Godʼs faithfulness in relying on God for their security. 28th Sunday Yr B – Can a camel get through the eye of a needle? The theme of wisdom is contrasted with wealth in the Gospel. A rich young man faithful to the ‘laws’ still finds himself unsatisfied in life. His question: ‘What must I do?’ is still focussed on external actions of obedience. Jesus wishes to lead him from ‘observance of laws’ to ‘living in love’. The invitation to change the base of his security from possessions to ‘treasure in heaven’ causes his face to fall. What possessions would you be terrified of letting go? Why? Do you trust that God will supply everything you need? The invitation to a deeper discipleship does not necessarily require letting go of ‘wealth’ but letting go of its ‘attachment’. Jesus uses an image. To get a camel loaded with items for trade through a ‘narrow gate’ in Jerusalem required unloading items, the camel sometimes having to kneel down and crawl through a small space (eye of a needle). Some scholars also suggest a misspelling of a word means it is a ‘cable’ that is trying to be threaded through the eye of a needle. How would you describe your ‘use of wealth’. Is it available for building the Kingdom of God? The needs of the poor? How much ‘security’ and ‘life’ does your bank balance or possessions bring you? What does this story reveal to you personally? Peter implies a disciples question about reward and security. 100% is an incredibly fruitful return. Normally a return would be 10%. It will be mixed up ‘with persecutions’ however. Consider asking a Priest, Brother, Sister, Christian friend how they have experienced God’s faithfulness in relying on God for their security.